Contest: WIN: a gift pack of Grain & Seed Bars! WIN: a gift pack of Grain & Seed Bars! 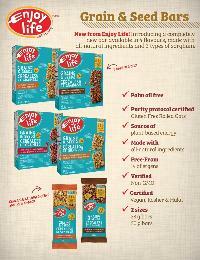 Prize: A gift pack of Grain & Seed Bars - Allergy friendly, gluten-free, paleo, vegan, non-GMO natural treats. Statistics: This contest was opened by 125 and entered by 7 ContestChest.com members. 6% of those who opened the contest, entered it.